Gamblogger: ‘Crazy Vegas’ This Week’s Slot-of-the-Week at Slotastic! 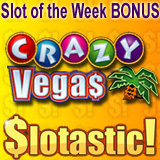 ‘Crazy Vegas’ This Week’s Slot-of-the-Week at Slotastic! This week, like every week, slots players can get a free $100 to play the Slot-of-the-Week at the new US-friendly slots site, Slotastic! (www.slotastic.com). From now until Sunday, the bonus slot machine is Crazy Vegas. All through January, the Progressive-of-the-Month is the Jackpot Pinatas slot. Players can get another free $100 to play this game whose massive $1.5 million progressive jackpot is the biggest online casino jackpot available to American players. Crazy Vegas is a 20-payline video slot machine game with symbols of Las Vegas spinning on its five reels: entertainers, showgirls, dice, cards, Roulette tables, Craps, chip stacks, and an emcee. It can be played for free or players can wager from $0.01 to $5.00 per payline. There are three animated symbols that trigger special features: Crazy Vegas, Big Bonus and Free Spins. For example, when ‘Free Spins’ appears on the second, third and fourth reels, the animated symbol reveals the number of free spins that have been won and the payout multiplier for the free spins round. The Jackpot Pinatas jackpot, which is now over $1,500,000, may be one of the largest progressive jackpots currently available, but there are two other seven-figure jackpots at Slotastic! that could make some lucky player an instant millionaire at any minute. The Aztec’s Millions jackpot and the jackpot tied to both the Mid-Life Crisis and Shopping Spree slots are all over $1 million. Later this week, as it does on the first of every month, Slotastic! will be sending players their Monthly Paycheck coupon code for January which will entitle them to a further $100 in bonus cash. Terms and conditions of all casino bonuses are posted in the ‘Promotions’ section of Slotastic.com. A toll-free Customer Service line is available 24-7.